This is pretty major news in the gaming world. First the Xbox 360 was reduced to $299, then Sony followed suit and reduced the PS3 to $299. So now Microsoft has hit back with a rebate that makes the Xbox 360 Elite a mere $249.99. This is major news since people tend to look at price first before making their selection. I’ve been looking to get a new Xbox 360 for a while after my old one finally went kaput, so this is great timing. It is also surprising that the price is this low even before the major holiday shopping season has begun. The Xbox 360 Elite is great for a couple reasons: 1) it is a slick black color and 2) it comes with a 120 gig hard drive which means you won’t have to worry about limited space. After a while on my old Xbox 360 I had to delete game saves – hard decisions had to be made. That is no prob with a 120 gig hard drive. The other reason you need a larger hard drive is because the Xbox 360 now gives the functionality of downloading certain games straight from Xbox live so you don’t even need the CD. You just pay for a full game with Xbox live credits. 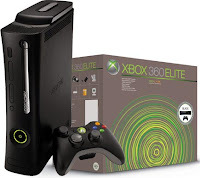 The Xbox 360 Elite, the premier Xbox 360 console package that includes a massive 120GB hard drive that is all wrapped up with a premium black finish. Xbox 360 Elite also includes a black wireless controller, black Xbox LIVE headset, standard definition composite cable, and an ethernet cable. Xbox 360 Elite has enough space for a whole library of Xbox LIVE Arcade games as well as downloadable high-definition TV shows, movies, music, and all the other content available from Xbox LIVE Marketplace. Go to the rebate site. Enter 49710555 as your password. Click here for full, official details on the rebate.